Say hello to the new and improved Adjustable Rate Mortgage. ARMs are back in demand and gone are the days of its risky features — interest-only and balloon payments — that might have scared you off in the past. With interest rates for fixed-rate mortgages on the rise, an ARM loan is a much cheaper alternative right now. 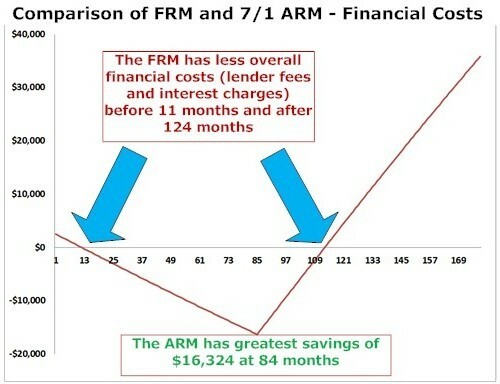 You could offset the cost of those rising rates and have lower, more affordable monthly mortgage payments with an ARM. Find out if an ARM loan is a good decision for you — as we’ve always said, not every loan is right for every person and it depends on your particular financial situation, goals, and home buying plans (not your neighbor’s, mom’s, or co-worker’s). For a certain time period, an ARM acts just like your standard 30-year fixed mortgage since payments are the same and interest rate doesn’t change. This initial fixed-rate period can be for 1 year to 3, 5, 7, or 10 years — you get to choose the timeframe. The current standard is 5 years or a 5/1 hybrid ARM. ARMs differ from fixed-rate mortgages in that the interest rate and monthly payment do not stay “fixed” for the length of the mortgage but fluctuate or “adjust” at some point during the life of the mortgage. After this fix-rate period, the rate is adjusted each year and the new payment is based on market indexes. The new rate and payment are calculated by determining what the index value is and then adding a margin to that figure. Buyers no longer need to be as wary when the rate starts to adjust. Lenders protect borrowers from extreme rate changes with payment cap limits, either with an annual cap or life-of-the-loan cap. That means that you will know upfront what interest rate your loan could never exceed and how often it could change and by how much. Make sure you read your closing documents for all of the specifics. Simply put, buyers are feeling a little sticker shock as fixed-rate mortgages (which track 10-year Treasuries) continue to climb. In fact, fixed rate mortgages have risen twice as fast as ARMs and are now at a two-year high (though still affordable at below 5%). On the other hand, the Federal Reserve is keeping short-term rates low and ARMs track those rates (1-year Treasuries). The spread is hard to resist: First, for every percentage point rate increase, buyers lose $50,000 dollars in purchasing power. Second, ARMs are up to 2 percentage points cheaper than fixed rate loans right now. That’s big savings for you! An ARM is good for buyers who have a plan for the next 5 or 7 years and will more likely move before the loan’s fixed-rate period ends. If you live in a small condo but your family is growing, an ARM will help you move to a larger home but let you take advantage of lower monthly payments for several years. If you plan to stay in your home for only 5 years, you really won’t be able to take advantage of the guaranteed rate of a fixed long-term loan. Instead, you can choose a 5/1 hybrid ARM — one that is fixed for 5 years and then adjusts upward. You will shave several percentage points off of the fixed 30-year rate, and as the 5 year adjustment draws closer, you already know that you will be moving on, and likely selling. Yes, you can trade your current loan for an ARM. You’ll lower both your interest rate and your payments over the short term. Right now ARMs offer much better rates. If you have a fixed rate of 4.5% on a 30-year mortgage, and trade it in for a 2.5% ARM, you will cut your monthly payment in half. If you’re a savvy homeowner, you can pay down your mortgage with the money you saved by getting an ARM. Your loan will be much more manageable and you will also be able to cope with any rate changes. If you don’t assume that housing prices will rise right along with your income when your ARM adjusts, you may be more comfortable with a fixed-rate loan.